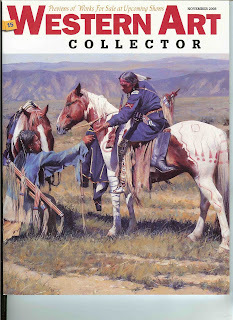 I got my complimentary copies of Western Art Collector in the mail today and sure enough there was an article about me in it. I knew it was going to be in there but to actually see it in print was totally cool. Michelle Borgwardt was fun to talk to and wrote a great article. This is the cover of the magazine for Nov. I am on page 98. I think it should be in stores like Barnes and Noble in a few days. Does it show that I am excited? I am... and not ashamed to say so. How exciting! I can't wait to get the mag and read it. You are amazing! Sorry it took me years to respond. I cried when I got the email. Shannon that is SO incredible. I am so incredibly happy that your beautiful work is getting the recognition it deserves. I'm not sure if I sent you the invite to the BYU blog or not but I think you should post this there. I think everybody else needs to rejoice in how amazing you are!!!! !